I had been trained as a pathologist for many years prior to my Ph.D. study in London, and naturally have been interested in the histopathology of muscle tissues from muscular dystrophy. I was not particularly interested in research of muscular dystrophy at first until I was fascinated by the “revertant fibers” in the diseased muscle of Duchenne muscular dystrophy. DMD muscles lack dystrophin expression, but a small proportion of muscle fibers actually have almost normal levels of dystrophin. I spent a lot of time trying to understand the mechanism(s) behind the reversion of fibers from no dystrophin to normal levels of dystrophin, and thought therapy could be developed if we know the mechanism. My studies in the Muscle Cell Biology Laboratory under Professor Terrence Partridge’s supervision in MRC Clinic Research Center, London, concluded that these revertant fibers in DMD muscles result most likely from the spontaneous “exon skipping”, not likely from further mutations. At that time, the concept of “exon skipping” for treating DMD was being reported. This together with my understanding of the revertant fibers lead me to the exploitation of exon skipping in the DMD model, MDX mice. Very excitingly, my study showed for the first time without the doubt that antisense oligonucleotide was able to achieve restoration of therapeutic levels of dystrophin in the DMD model and the result was published in the Nature Medicine in 2003. We soon formed a group in the UK to start the preparation for clinic trials of oligonucleotide therapy to DMD with Dr. Francesco Muntoni as PI. The fact that a research result can be directly translated into clinic applications greatly raised my interest and pushed me onto the muscular dystrophy research forever. By coincidence, Carolinas Medical Center was at the time looking for someone to establish a new laboratory to study one type of limb girdle muscular dystrophy (LGMD) with a newly identified genetic defect, FKRP gene mutations. I was recruited in 2004 to the Carolinas Medical Center as the Director to set up the McColl Lockwood laboratory for Muscular Dystrophy Research. 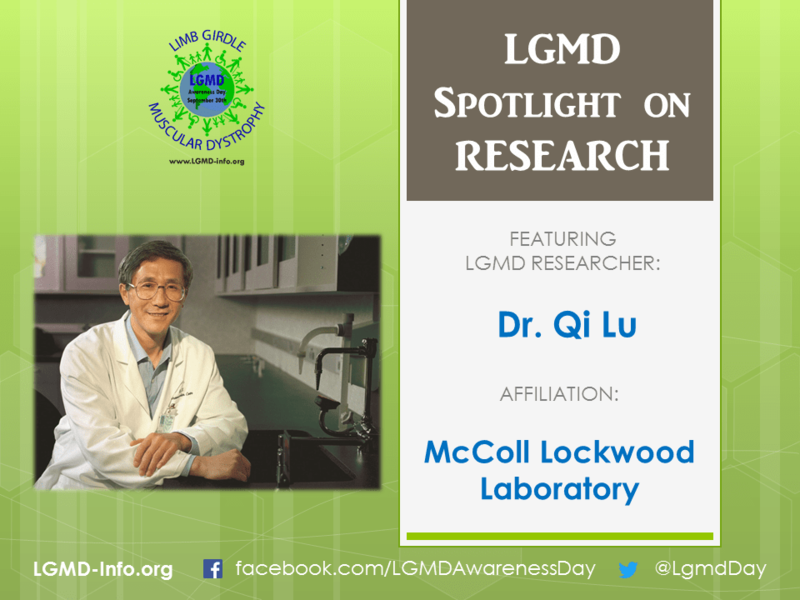 The McColl Lockwood laboratory specifically targets the LGMD2I caused by mutations in the FKRP gene. This specific type of muscular dystrophy is also called dystroglycanopathy because the main defect directly causing muscle weakness is the lack of one specific sugar (glycan) which is normally decorated on one of the muscle fiber surface protein called dystroglycan. This sugar on dystroglycan is critical for connecting individual muscle fibers together to form a strong rope instead of acting individually, thus minimizing possible damage when your muscle contracts. Lack of sugar disrupts the connection and causes progressive muscle damage, and gradually leading to scar formation and loss of function. During the first a few years, my lab conducted two major programs, one for further exploitation of exon skipping therapy for DMD (a left-over project from my early research) and the other for the establishment of model systems both cell culture and mouse models for FKRP-related muscular dystrophy. During the last 6 years, nearly all projects have been directed to develop experimental therapy to the FKRP muscular dystrophy which includes the LGMD2I and some cases of congenital muscular dystrophy. The main projects for therapeutic development we have undertaken so far include: 1) drug screening to identify compounds capable to restore/enhance functional glycosylation; 2) AAV gene therapy to compensate for the loss of function due to mutations in the FKRP gene. 3) Evaluation of existing drugs to assess their therapeutic potential for muscular dystrophy; and more recently 4) sugar therapy to restore the glycosylation of dystroglycan. All these therapy studies have been carried out in our FKRP mutant mouse models containing the mutations identified in patients and with disease manifestation similar to what observed in clinics. As I described above, our research programs are translational in nature, focusing specifically on therapy development. As indicated from our publications made in the last a few years, therapeutic potentials have been demonstrated with three types of treatments: 1) a non-disease specific treatment with the existing drugs, such as Tamoxifen and raloxifene with significant long-term benefit to muscle pathology and function in the FKRP mouse model. This treatment could potentially be applied to all LGMDs; 2) AAV gene therapy, specific to FKRP-mutation-related muscular dystrophy. This therapy has been demonstrated with the potential to achieve near complete prevention of disease progression; and 3) a treatment with ribitol, a metabolite normally present in our body. This therapy is also disease-specific and has shown to effectively enhance the glycosylation of dystroglycan with significant improvement in muscle pathology and function. All these experimental therapies have been performed using our FKRP mouse model and can be moved on to clinical trials. Well, we want them to know clearly what the nature of their individual disease is. Importantly, for patients and parents, what mutations of what gene they have. This information is all critical as we are entering an exciting era of individualized medicine. From the beginning, this might sound difficult, but everyone can grasp it if you persist trying. The disease mechanism for almost all muscular dystrophy in principle is much simpler than most of the disease we hear and easy to understand. With this knowledge, it will be easy for you to understand the research and to interpret available therapeutics in your own way. This will also enhance the communication between you and researchers. Two specific factors I would like to mention here: first, a life not bored by repeating the same or similar things day-in and day-out. The majority of experiments you do at any time will have new aspects to look for. That is a type of hope and desire which most people would consider a good life! Second, the initial success in identifying oligonucleotide therapy for DMD inspires me to think that something useful even directly towards patient treatment can actually be achieved through my research. Of cause also important is that I have unwavering support from the Carolinas Healthcare Foundation and parents, allowing me to conduct research and avoid forced diversion in research focus and even career. We, the researchers, patients, and parents are another layer of the big society. We need stimulation, encouragement, and support from each other to live better and make progress faster. As a researcher, we cannot provide therapy, but we believe we have some specific and useful knowledge about the disease and about potential therapies. We love to have patient/parent input, that includes any question related to the disease. For example, if you have a question about whether a therapy will be relevant to you and how it works, then ask. Another example, if you have a specific symptom, but don’t know if it is related to the disease or not, you can ask us as well and we can think about the possibility although it might not lead to any clear answer or solution. These types of contact may not sound special, but they demonstrate the mutual appreciation and stimulate researchers’ curiosity and responsibility.